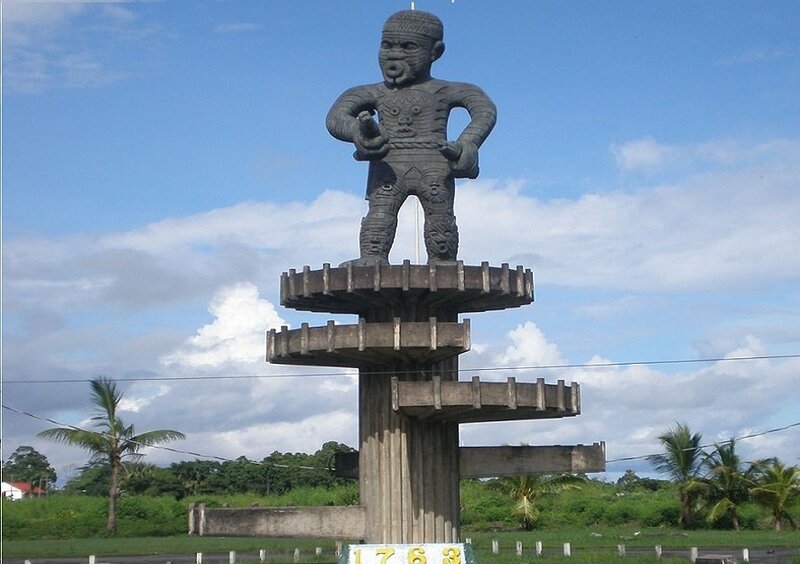 Cuffy was an Akan slave who was transported to the Dutch colony of Berbice; present-day Guyana. Cuffy led a slave uprising of over 2,500 slaves. Living in a plantation in Lilienburg on Canje River, Cuffy and his followers seized artillery and gunpowder and proceeded to take over the plantations in his community and those within close vicinity. Though Cuffy and his supporters agreed to cease their operation, they killed many. Cuffy captured the wife of the Bearestyn Plantation owner and kept her as his wife. The anniversary of the rebellion on February 23 is celebrated in Guyana as Republic Day. Cuffy is memorialized in the 1763 Monument in the Square of the Revolution in the capital Georgetown. Cuffy who was also referred to as Coffy, Kofi or Koffi Badu, was born in Ghana, West Africa; the exact date is unknown. Captured from his native land, Cuffy eventually ended up as a house slave of a barrel maker. 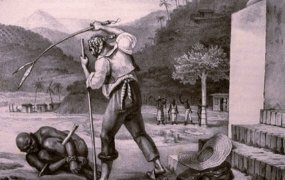 On February 23, 1763, Cuffy armed with weapons and numerous slaves, overtook plantations in Berbice and surrounding areas. They took control of the Peerboom brick house. Although they agreed to relinquish it, they kept control and took many prisoners. Cuffy was a skilled fighter. He was classified as the leader of the slaves and declared himself the Governor of Berbice. 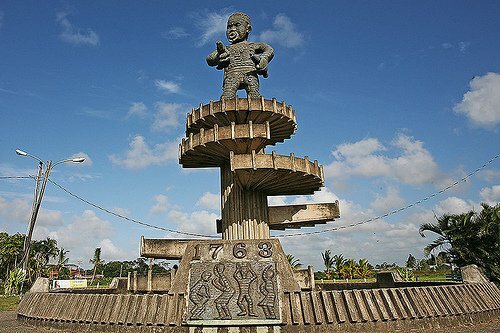 Another slave, Akara attacked Dutch colonizers three times without Cuffy’s consent. This caused a rift between Cuffy and Akara. On April 3, 1763, Cuffy wrote to Governor Van Hoogenheim and attempted to form a truce by proposing that the Dutch occupy the outskirts of Berbice and that the blacks live in the heart of Berbice. Van Hoogenheim delayed his response as he awaited support from other colonies. On May 13, Cuffy and his forces attacked the Dutch but incurred many casualties. The defeat caused a separation between the slaves. A civil war ensued between Akara and Cuffy in which Akara won. Cuffy committed suicide in 1763.